Here are some tags I've made to give to some of my friends. 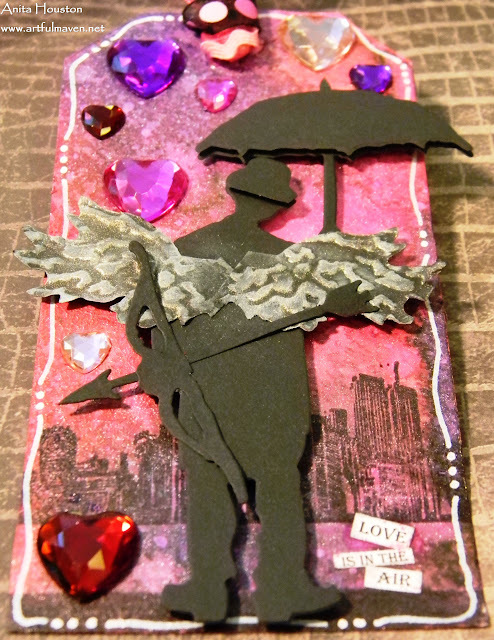 I am submitting this reinvented Umbrella Man, now Cupid, tag to Inspiration Journal's Monthly Challenge of "Love". 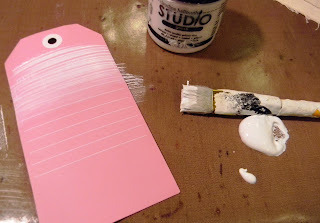 I applied Claudine Hellmuth's Gesso to a #8 tag to strengthen it. After it dried, I sprayed (No photos, sorry.) Dyan's Funky Fuchsia, Bubblegum Pink, Crushed Grape, and Postbox Red Dylusions Ink Spray to the tag. I dried it thoroughly. I flicked water on the tag and dried it again. Then, filling a Mini Mister with Picket Fence Distress Stain, I flicked some Stain on the tag as well and dried it. I finished the background with Perfect Pearls Mist. I die cut several Tim Holtz Sizzix Umbrella Men and Cupid in black cardstock. I added foam tape to the umbrella top and the top hat and added another layer there. I attached the arrow and bow to the Umbrella Man's hand as if he is hiding it behind his back. I snipped the wings from Cupid. 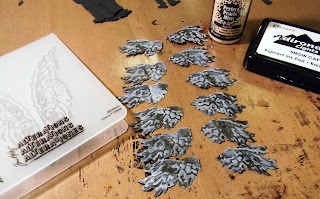 I ran the wings through the Wings Texture Fade, and inked the raised parts with Snow Cap Pigment Ink From Ranger. I misted them with Biscotti Perfect Pearls for a little sheen. 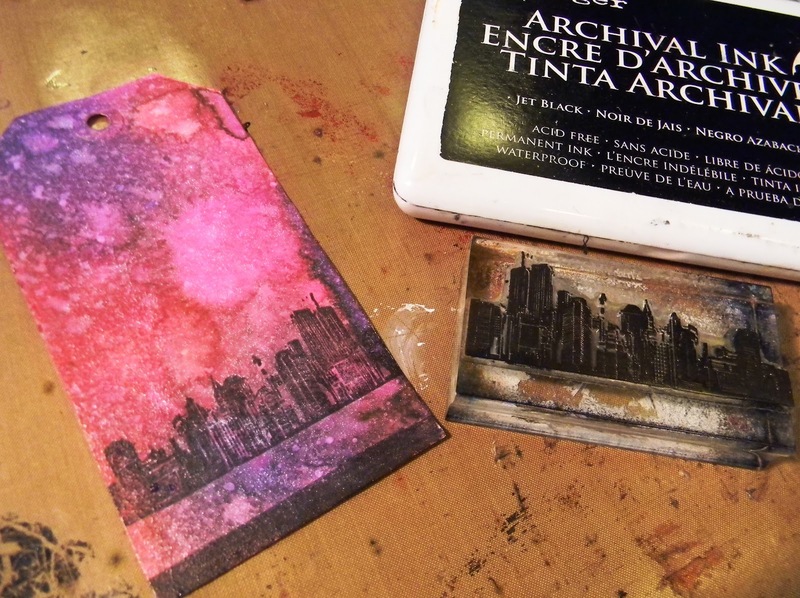 I stamped Tim's image of the City on the tag in Jet Black Archival and added a little to the bottom to mimic a shoreline from afar. 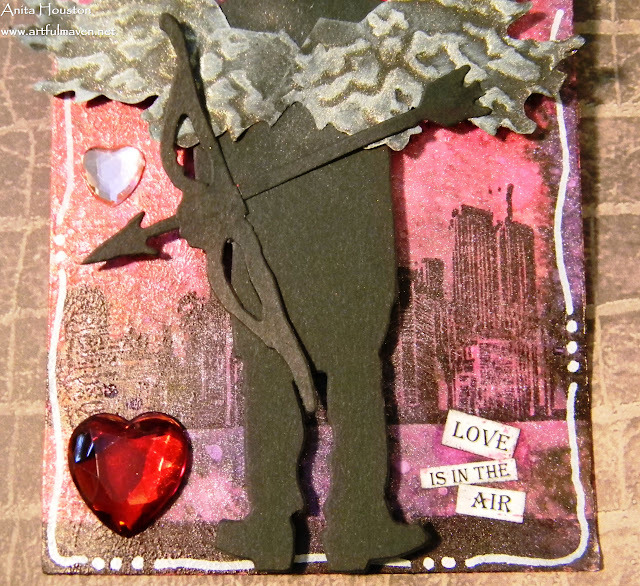 After I added my new Cupid, I added some doodling and rhinestone hearts raining down. The sentiment was computer generated. Great tag! I'm so stealing the white ink markings around the edges! I'm so not ON to using the spray inks. I am going to give up and move on to things I can actually control! Always so creative Anita! Love the background, hearts falling through the sky, the skyline and the doodling. Bravo! A wonderful tag - a wonderful present(treat) for dear friends! Beautyful and I love it! What a wonderful way of using the umbrella man & the background is terrific. A really great look for umbrella man!lovingthe wings trace x.
Dear Anita, I have never seen such a usage of the "umbrella man" this is just oustanding can´t believe what amazing work of art you have done here. Fantastic - I just love it - such a great inspiration! Love the composition of this tag. Such a great look! I enjoyed seeing how you created this piece!! Fabulous background Anita and I so love the embellishments. The umbrella man is looking fab with his wings and arrow. Woohoo!! I love this tag, the background colors are awesome! 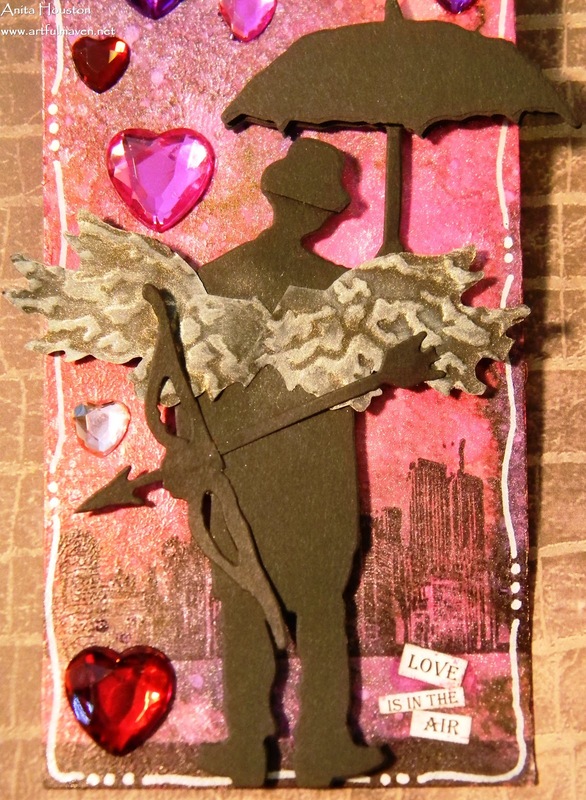 I love that you stamped the city scape too and your umbrella man looks so cool with his wings and bow and arrow. I agree with you, Valentines Day is about Love and CHOCOLATE!! Haha!! Umbrella man is my favourite and to see him as Cupid is delightful. Love the embossed wings and the bow and arrow behind his back. No one would ever suspect him! Wonderful background with the skyline and all that love raining down on him. 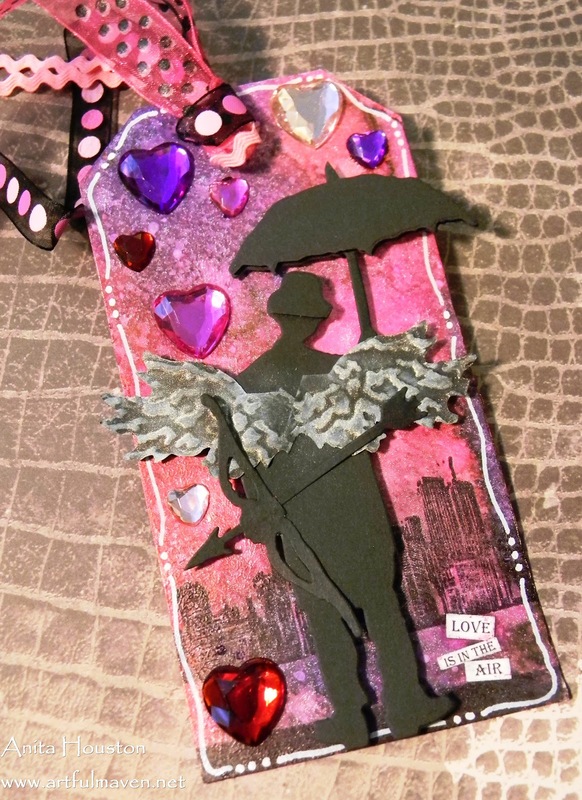 Love how you did Umbrella Man, Anita, and gave him those extra parts ---- how COOL is that?!?!? And your background is amazing. What a fabulous tag. LOVE it! These are so amazing, Anita! 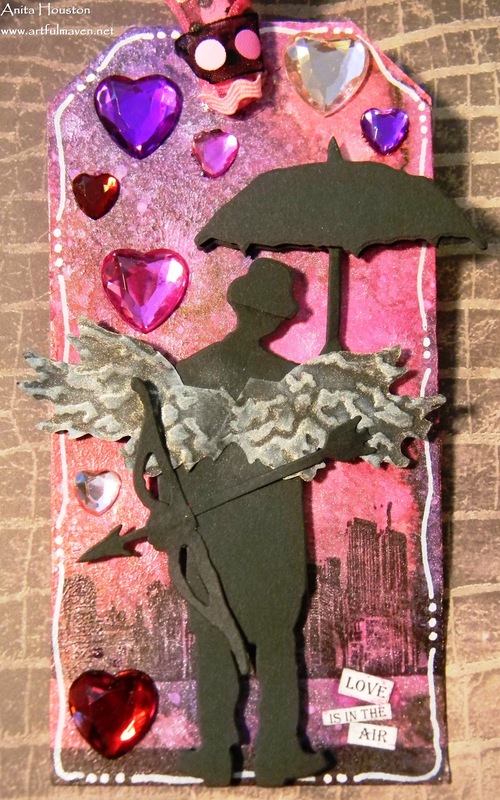 That background is to die for, and your fabulous winged Umbrella Cupid looks just fantastic against it! So pretty Anita. 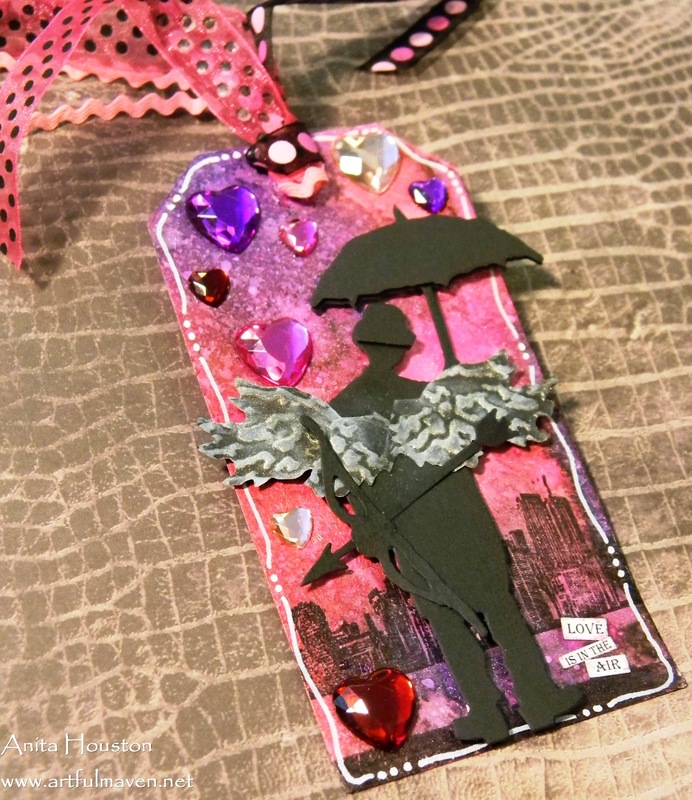 Love the way you have added the bow and wings to umbrella man so very creative. 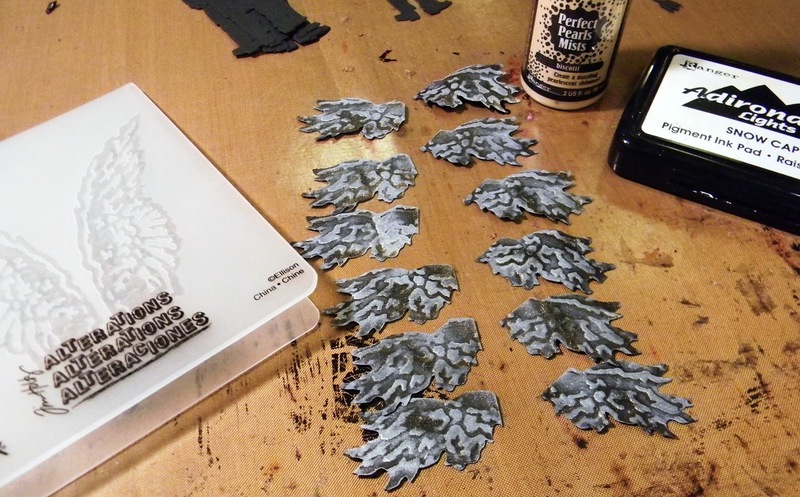 The creative way in which you combined the different dies is brilliant, Anita. Blessings! There's that attention to detail again! Love this take on Brolly Man with all of the gems floating about. Good thing he's got the brolly to protect him for falling gems! Ugh....I wrote this great comment, and then blogger ate it. So, here we go again, I hope I can recapture my thoughts. I love the whimsy of this tag. The way the umbrella man is standing on the shore (which you so brilliantly created...one of my favorite things) gazing across the water is very sweet. I love that you turned him into Cupid. FUN! And I love the sunset/sunrise colors you used...very romantic. The white hand drawn border is one of my favorite things here...it just draws the eye in and makes everything pop. 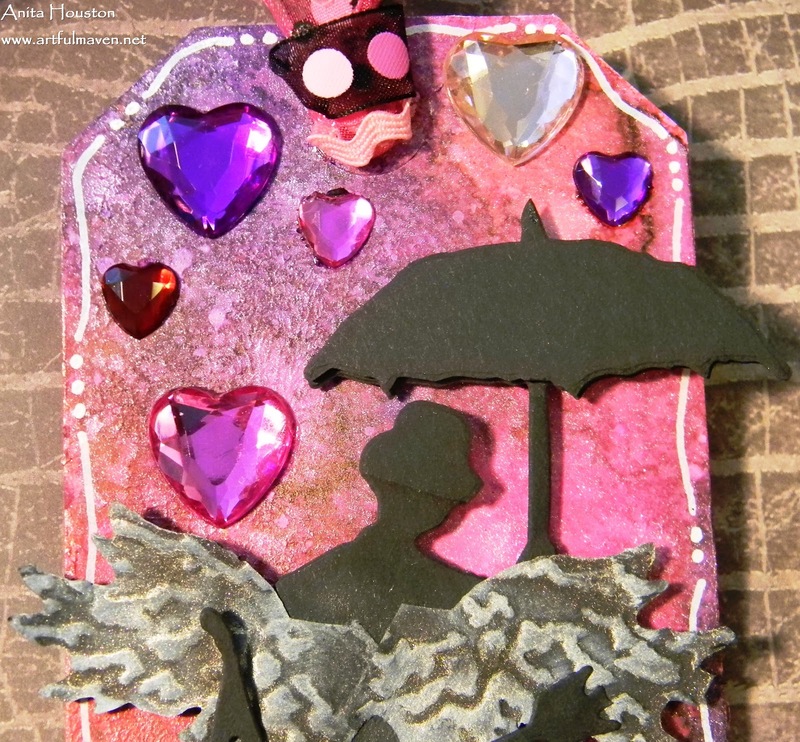 And the hearts raining down on the umbrella man? So playful! 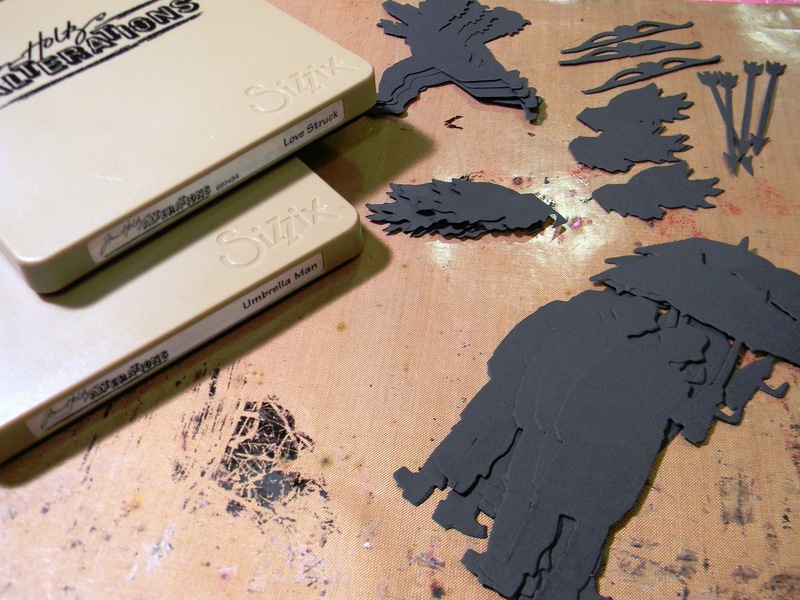 Just a great, great piece and oh, the lucky ones who will be receiving it! Thanks, Anita...you made me smile! I love everything about this tag, Anita! You are so cleverly creative - all the various techniques you used come together perfectly for the end result. And best of all -- it will be mine!!! Thanks so much! Love it! Interesting, to me it looks like parts of this are fabric or felt. I love how you turned umbrella man into Cupid! The background is fantastic! Great tag! Anita, Umbrella man has never looked so good. He makes a perfect cupid!!! I love how you used the Umbrella man for this. Really adorable!! How cool, love this idea :) A wonderful tag. ADORE this....Thanks so Much for Playing with us at IE!